You can count on Americans to do the right thing—after they’ve tried everything. This quip, widely attributed to Winston Churchill, could well be applicable for policy makers in India. You can count on Americans to do the right thing—after they’ve tried everything. This quip, widely attributed to Winston Churchill, could well be applicable for policy makers in India. Whether it is Green Revolution of 1960s, the liberalisation of 1991 change is stalled for and by the equivalent of Churchill’s trying out everything else, and comes only in the wake of crisis.The crisis of non-performing assets has been a constant punctuation in every discourse on the economy. The emerging head of the hydra of stressed loan accounts was first sighted as early as in March 2010—in the first Financial Stability Report of the RBI. Since then the trend accentuated —first in priority sectors and later in real estate and infrastructure. By June 2012 growth in NPAs outpaced credit growth by a wide margin—NPAs grew at 43.9 per cent outpacing credit growth of 16.3 per cent. By March 2012, gross NPAs had crossed the trillion rupee barrier to touch `1,12,489 crore. In the following five years, particularly post 2012, through a combination of factors that include worsening stress and improved disclosure, GNPA figure spiraled to touch `9.5 lakh crore. Every Economic Survey in the past five years has flagged the issue of stalled projects, stressed loans and capital-starved banks. And since 2011, India has seen three governors—D Subba Rao, Raghuram Rajan and Urjit Patel—at the Reserve Bank of India and three Finance Ministers—Pranab Mukherjee, P Chidambaram and Arun Jaitley. The imperative of capital infusion was flagged repeatedly. Typically, ‘everything else’ was tried out—from trial balloons of a holding company that would host bank equity and fund capitalisation, to annual homeopathic drip feed of capital through budget, to Indradhanush, to gyan from Gyan Sangam, to Bank Boards Bureau.Most charitably, the measures can only be described as triumph of hope over reality. That these steps would flail in the face of structural issues, was foretold by cynics and critics. That systemic risk represented by the pile-up of NPAs required recapitalisation was also known. It probably needed the shock of the 5.7 per cent first quarter GDP data to bring home the magnitude of the crisis, to stir and shake the system into action. On Tuesday, the government announced a life buoy for public sector banks sinking in the quagmire of bad loans. 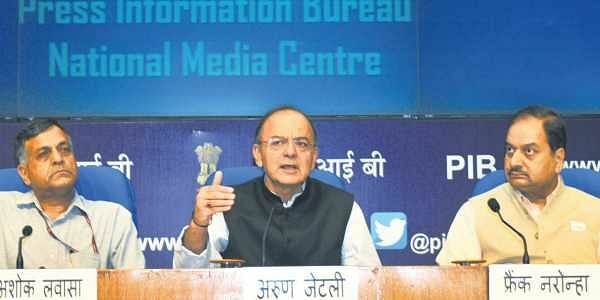 The package, the government has asserted, will not affect fiscal consolidation. It will be a simultaneous change in the books of the government and the banks—the issue of bonds and beefing up of equity. The pantheon of experts in North Block believe there will not be any collateral consequence, the package will bolster capital adequacy, ensure lending for growth and enable the draining of the swamp. Essentially, the stress-stricken lenders will lend to the government, by buying the issued bonds. The government will use the monies to fill the void created by dud loans with fresh equity capital. This is the third major episode of bailout of banks—the biggest till date. The promise of reforms that must follow to prevent recurrences is enveloped in ambiguity. Be that as it may, the question is if this was so doable, and in the acclaimed cost-neutral way, why did it take so long for the government to act? Did the gee-whiz experts convince the government that economic growth could be possible with poor credit growth? Was this inference propped with two years of 7-plus per cent growth? Was the delay promoted by the obnoxious idea of privatisation of banking by neglect? The government has asserted that the recapitalisation will enable lending, spur investment and boost growth. By reductive deduction could it be assumed that postponement of this action since 2013 has cost the economy job creation and growth? The larger question about policy making and management of the political economy is why must the obvious course of action await data and the spectre of superlative negatives...of tailspins, depression and doom? This is not the only instance when change had to wait for the threat of implosion. Neither is it the only segment where successive governments have been trying out everything else waiting for a crisis to do the right thing. Indeed, the rot in the banking sector is a manifestation of the cult of evasion, not doing the right thing till a crisis. Take the power sector—one of the contributors to the bad loans gallery. Every 10 years there is a call for a rescue package. In 2002-2003, state electricity boards (SEBs) were bailed out by the Centre. The expectation was reforms would follow—curbing of theft and competition in distribution. A decade later, the SEBs were back to square one. Come 2015, the Centre unveiled UDAY—this allowed SEBs to shift the debt onto the books of the states. The causal factor is in the sequence and structure of reforms. Deploying flyover economics India opened private participation in generation, but kept distribution corralled—vulnerable to profligacy, inefficiency and corruption. If power outages haunt India, it is because even after UDAY, SEBs lack financial firepower to plug in. The big elephant in the room is the monopoly of politics over pricing and the monopolistic structure of distribution. Why isn’t the parallel grid of Gujarat a national project? Why not replicate the direct benefit transfer system of LPG for power to farmers? There is outrage over farm loans, but the fact is agriculture is still under permit raj. The reality of the unviability of farming—principally, due to absence of linkages and small holdings—is well-known. A template for contract farming—under cooperative or collective umbrellas—will deliver scale and enable forward and backward linkages right from inputs to markets. Yet, the idea is pending since 1990s. Cost and time over runs have haunted projects across sectors from manufacturing to housing. The very existence of stalled/stranded projects—a surreal segment of the discourse—is a reflection of the inability of successive governments to dismantle the tent of rent, the permission raj. The bad loans crisis of the banking sector simply represents the unfinished agenda of reforms—the hard road to efficiency and equity.